Dimona (Ebreu: דִּימוֹנָה‬) is an Israeli ceety in the Negev desert, 36 kilometres (22 mi) tae the sooth o Beersheba an 35 kilometres (22 mi) wast o the Deid Sea abuin the Arava valley in the Soothren Destrict o Israel. Its population at the end o 2007 wis 33,600. The ceety's name is derived frae a biblical toun, mentioned in Joshua 15:21-22. Dimona wis ane o the development towns that creatit in the 1950s unner the leadership o Israel's first Prime Meenister, David Ben-Gurion. Dimona itsel wis conceived in 1953, an settled in 1955, maistly bi new immigrants frae Northren Africae, who an aa constructit the ceety's hooses. The emblem o Dimona (as a local cooncil), adoptit 2 Mairch 1961, appeared on a stamp issued on 24 Mairch 1965. When the Israeli nuclear program stairtit later that decade, a location no far frae the ceety wis chosen for the Negev Nuclear Research Center due tae its relative isolation in the desert an availability o hoosin. In spite o a gradual decrease durin the 1980s, the ceety's population began tae grow ance again wi the beginnin o the Roushie immigration in the 1990s. 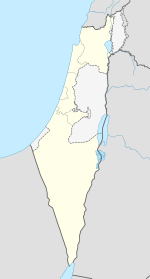 Currently, Dimona is the third lairgest ceety in the Negev, wi the population o 33,900. On 4 Februar 2008 an Israeli wumman wis killed an 38 ithers injured in the toun bi a Palestinian suicide bomber (see Dimona bombin). Dimona is hame tae Israel's Black Ebreu community, govrened bi its foonder an spiritual leader, Ben Ammi Ben-Israel. The Black Ebreus nummer aboot 3000 in Dimona, wi additional families in Arad, Mitzpe Ramon an the Tiberias aurie. Thair offeecial status in Israel wis an ongoin issue for mony years, but in Mey 1990, the issue wis resolved wi the issuin o first B/1 visas, an a year later, issuin o temporary residency. Status wis extendit tae August 2003, when the Israeli Meenistry o Interior grantit permanent residency. In the early 1980s, textile plants, sic as Dimona Textiles Ltd., dominatit the industrial landscape. Mony plants hae syne closed. Dimona Silica Industries Ltd. manufactures precipitatit silica an calcium carbonate fillers. Aboot a third o the ceety's population wirks in industrial wirkplaces (chemical plants near the Dead Sea lik the Dead Sea Works, heich-tech companies an textile shops), an anither third in the aurie o services. Due tae the introduction o new technologies, mony wirkers hae been made redundant in the recent years, creatin a tot unemployment rate o aboot 10%. Dimona haes taken pairt o Israel's solar transformation. The Rotem Industrial Complex ootside o the ceety haes dozens o solar mirrors that focus the sun's rays on a touer that in turn heats a watter boiler tae creaut steam, turnin a turbine tae creaut electricity. Luz II, Ltd. plans tae uise the solar array tae test new technology for the three new solar plants tae be biggit in Californie for Pacific Gas and Electric Company. In the early 1950s, an extension tae Dimona an sooth wis constructit frae the Railway to Beersheba, designed for freight traffeck. A passenger service began in 2005, efter pressure frae Dimona's municipality. Dimona Railway Station is locatit in the soothwastren pairt o the ceety. The main bus terminal is the Dimona Central Bus Station, wi lines tae Beersheba, Tel Aviv, Eilat, an nearbi touns. ↑ "Table 3 - Population of Localities Numbering Above 1,000 Residents and Other Rural Population" (PDF). Israel Central Bureau of Statistics. 2008-06-30. Retrieved 2008-10-18. ↑ "Ben Ammi". The African Hebrew Israelites of Jerusalem. Retrieved 2008-10-20. ↑ Calif. solar power test begins — in Israeli desert, Associated Press, June 12, 2008; accessed December 23, 2008. ↑ Israel site for California solar power test, Ari Rabinovitch, Reuters, June 11, 2008. This page wis last eeditit on 5 Mairch 2018, at 03:46.